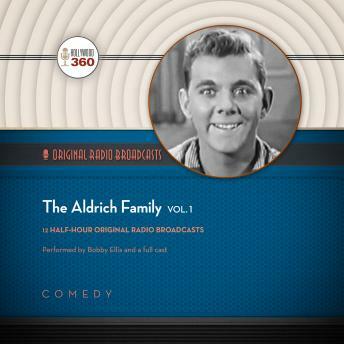 The Aldrich Family was a popular situation comedy that was heard on radio and seen in films, on television, and in comic books. Teenager Henry Aldrich, the creation of playwright Clifford Goldsmith, was an endearingly bumbling kid growing awkwardly into adolescence. Episodes revolved around Henry's misadventures with girls, his family, and his friends. Henry Aldrich was portrayed on radio by twenty-something Ezra Stone when The Aldrich Family launched as a summer replacement program for The Jack Benny Show on NBC in 1939. He kept the lead role until 1942, followed by others, including Bobby Ellis, who became the last Henry Aldrich in 1952. The show had a top-ten rating within two years of its launch, landing it solidly alongside The Jack Benny Show and Bob Hope's The Pepsodent Show. Earning $3,000 a week, Goldsmith was the highest paid writer in radio, and his show became a prototype for the teen-oriented situation comedies that followed on radio and television.